Marine Protected Areas (MPAs) are known to contribute toward the conservation of marine biodiversity, particularly targeted fishery species. Snapper Chrysophrys auratus are an important recreational and commercial fish species in New South Wales (NSW), Australia, and despite fishery management for this species, they are considered “growth overfished” in this region. To assess how C. auratus respond to the implementation of an MPA with several no-take and partially protected areas in temperate NSW, we monitored their populations over a decade (2006–2017) using baited remote underwater video systems (BRUVs). Surveys were conducted in the Port Stephens-Great Lakes Marine Park with BRUVs deployed on rocky reefs in depths of 20–50 m. Long term seasonal sampling (winter vs. summer) was undertaken at two locations (Broughton and Fingal Island), and changes in C. auratus abundance prior to, and 8 years after zoning implementation, were assessed between these two locations. In total, we sampled five no-take areas within the marine park and five comparative nearby partially protected fished areas and three sites located outside the marine park boundaries. The most pronounced changes in abundance and size structure for C. auratus were observed in the Broughton Island no-take area where numbers increased almost 3-fold (2.91 times) over 8 years of protection. 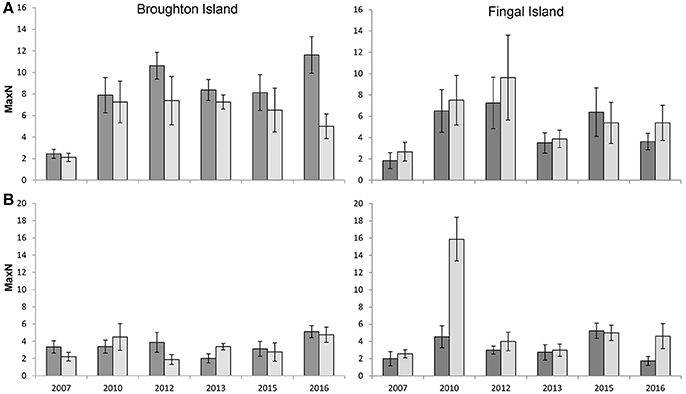 Relative abundance showed seasonal variation at two locations, and we consistently recorded increasing abundance within no-take areas at Broughton and Fingal Island compared to nearby sites open to fishing. Surveys across the five no-take areas found a significant increase in the abundance of C. auratus, whilst the five partially-protected locations in the marine park still recorded higher abundances than sites outside the marine park. In addition, length measurements from stereo-BRUVS indicated that C. auratus were significantly larger in no-take areas compared to partially-protected areas in the marine park and sites outside the marine park. This study demonstrates how the implementation of the marine park and the protection afforded by no-take and partially-protected areas provides refuge for this important fishery targeted species. The establishment of Marine Protected Areas (MPAs) to protect and conserve marine biodiversity is now a well-established practice worldwide (Halpern, 2003; Sciberras et al., 2015). Multiple use MPAs have been established in many countries, such as Australia, which provide different levels of protection through zoning and allow some areas for fishing (partially-protected) and other areas that are total no-take which exclude all forms of fishing. No-take areas within MPAs often show an increase in abundance and size of harvested species and measurable changes in the trophic structure (Halpern et al., 2010; Sciberras et al., 2013; Edgar et al., 2017), although the size of the effect is strongly influenced by factors such as reserve size, location and age, levels of compliance, life-history characteristics, and population status of harvest species (Claudet et al., 2008; Edgar et al., 2014; Malcolm et al., 2016). Due to these responses, MPAs are increasingly recognized as one tool that can contribute to managing some pressures associated with fishing at spatial scales related to the size of the MPA and associated zones (Gaines et al., 2010; Sciberras et al., 2015; Campbell et al., 2017). However, there is some debate to whether MPAs provide broader benefits to harvested species that are already considered well managed (Kearney et al., 2012; Hopf et al., 2016). In particular, the extent of spill-over from no-take areas is highly variable and untested for most species (Buxton et al., 2014), although several studies have demonstrated that MPAs can result in higher fish abundance in surrounding areas (Kerwath et al., 2013; Sackett et al., 2017) and contribute to larval replenishment to surrounding populations (Harrison et al., 2012; Peters et al., 2017). The snapper Chrysophrys auratus (family: Sparidae) is one of the most important recreational and commercial fishery species in temperate Australia and New Zealand coastal waters, and can show increased abundance and size following the implementation of no-take areas (Denny et al., 2004; Malcolm et al., 2015). Several studies have shown that the abundance of C. auratus and their size were found to increase within no-take MPAs when compared to sites outside MPAs. For example, in northern NSW, C. auratus were found to be significantly more abundant and larger within no-take areas in a sub-tropical MPA compared to sites outside the MPA (Malcolm et al., 2015). 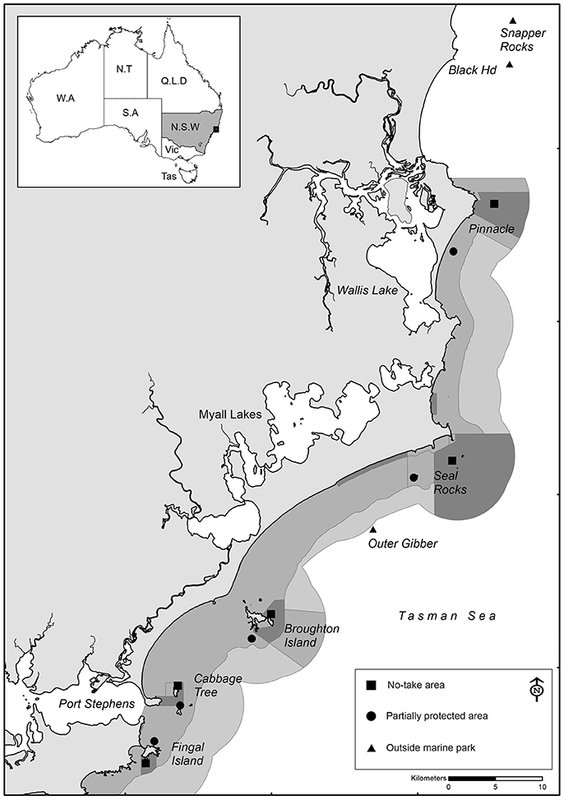 In New Zealand, C. auratus were found to have increased catch rates within the Cape Rodney–Okakari Point Marine Reserve (Millar and Willis, 1999), whilst also showing significant increases in abundance and biomass in no-take areas relative to fished areas (Willis et al., 2003; Denny et al., 2004). While adult C. auratus are found on rocky reefs across the continental slope in depths from 5 to 200 m (Curley et al., 2013; Parsons et al., 2014), juveniles are predominantly encountered within coastal embayments and estuaries (Hartill et al., 2004; Poulos et al., 2013). Acoustic telemetry studies have found that C. auratus movement patterns vary based on their size and region. In NSW and New Zealand, it has been demonstrated that C. auratus can display strong site fidelity and maintain small home ranges, and therefore can benefit from relatively small protected areas (Willis et al., 2001; Parsons et al., 2003, 2010; Harasti et al., 2015a). Tagging and tracking studies have also shown that C. auratus can be highly mobile, moving up to ~100 km (Sumpton et al., 2004; Fowler et al., 2017). Within NSW, six multiple-use MPAs (defined as marine parks) have been established to protect and conserve marine biodiversity, covering ~34% of the state's waters. These include no-take areas, referred to as “sanctuary zones” in NSW, which cover ~6% of NSW estuarine and coastal waters. The largest marine park is the Port Stephens-Great Lakes Marine Park (PSGLMP) which was declared in 2005 and covers an area of ~98,000 hectares of temperate estuarine and inner continental shelf waters. The PSGLMP has differing levels of protection within three main management types. No-take areas provide the highest level of protection as they prohibit all forms of fishing and cover ~17.5% of marine park waters. Partially Protected Areas (PPAs), known as Habitat Protection Zones in NSW, cover 38.2% of the park and allow recreational line and commercial trap and line fishing; however, activities such as commercial trawling, longline, setline, dropline, and purse seine are prohibited. In addition to commercial fishing restrictions within the PPAs, there are also some restrictions for recreational fishing in several locations that restrict the use of bait, prevent anchoring, and only allow trolling. The majority (43.8%) of the marine park is zoned “General Use Zones” that allows most forms of fishing (including trawling), but excludes longlining, setlining, and droplining. The final zone is “Special Purpose Zones” that cover 0.5% and are provided for specific management of aquaculture and marinas. The aim of this study was to assess the effectiveness of the zoning arrangements in PSGLMP in providing protection to the main fishery targeted species in the region. To assess how no-take and PPAs of the PSGLMP may be impacting on C. auratus, a long-term baited remote underwater video (BRUV) program was implemented on rocky reef habitats at locations within and outside the marine park. The use of BRUVs to assess changes in fish abundance within and outside MPAs is a well-established method (Watson et al., 2009; Coleman et al., 2015) and have been used successfully for estimating abundance of C. auratus (Willis et al., 2000; Malcolm et al., 2015). Specifically, this project aimed to assess (1) if the relative abundance of C. auratus showed seasonal variation, (2) if the relative abundance of C. auratus within no-take areas increased following implementation of protection status, (3) if the relative abundance of C. auratus would increase in no-take areas compared to fished areas, and locations outside the marine park, (4) if the relative abundance of C. auratus in areas open to fishing within the marine park declined as a result of shift in fishing effort, and (5) whether the size of C. auratus within no-take and PPAs is larger than those found in areas open to fishing outside the marine park. Figure 1. Location of sampling locations within the Port Stephens-Great Lakes Marine Park, New South Wales, Australia. Each sampling period involved the deployment of BRUVS for a period of 30 min, as per the methods described in Malcolm et al. (2007) and Harasti et al. (2015b). BRUVS consisted of Canon or Sony video cameras with wide angle lenses. Eight deployment sites were haphazardly selected on each sampling occasion for each location. Four BRUVs were deployed at a time with BRUV units separated by ~200 m and deployed on rocky reef habitats in depths of 20–50 m. Following retrieval, BRUVs were then subsequently deployed at another four replicate sites giving eight deployments per location. Stereo BRUVs were calibrated prior to each sampling period following the methods detailed by Harvey and Shortis (1998) and checked regularly with scale bars of known lengths to ensure measuring accuracy. Approximately 1 kg of crushed pilchards (Sardinops neopilchardus) was used as bait, which were mashed into a plastic mesh bait bag attached to the end of each bait-pole (~1.5 m distance from the frame) to attract fish to the field of view (Harvey et al., 2007). Stereo video is a proven method for accurately measuring fish lengths of various size classes (Harasti et al., 2016). Following the deployment, BRUV units were retrieved and video files were downloaded off each camera and analyzed using SeaGIS Eventmeasure software (version 3.1–4.1). When reviewing the video footage, fish species were recorded and identified with their respective MaxN. MaxN is in an indication of relative abundance of a fish species and is the maximum number (MaxN) of any individual fish (of a particular species) in the frame at any one time during each set (Cappo et al., 2004). To minimize the effects of water visibility on relative abundance (MaxN) of C. auratus, the field of view was standardized to ~2 m behind the bait bag estimated visually by the video analyser for the single BRUV units and using distance measurements in Eventmeasure for the stereo-BRUVs. For stereo-BRUV deployments, the length of each C. auratus observed at the time of MaxN was measured as total length (tip of fish nose to tip of tail fin). The largest C. auratus observed (based on measurements made throughout the 30 min video) was also recorded and measured for a comparison of Lmax (Maximum length observed) between zone types. Generalized linear mixed models (GLMM) were used to assess the effects of season, location and zoning on the relative abundance and total lengths of C. auratus in the PSGLMP. Three separate models were fitted to assess the project aims. All GLMMs were fitted using the “lme4” package in R v3.4.3 (R Core Team, 2017). To assess seasonal variation in C. auratus, surveys were conducted in February-April as that is when water temperature is at its warmest (~22°C) in the PSGLMP, and collected again in July–October when it is at its coldest (~18°C) (Harasti and Malcolm, 2013). Data collected in summer (warm water) and winter (cold water) were modeled across a 6 year period at two locations (Broughton Island and Fingal Island) to determine if there were seasonal patterns in the relative abundance of C. auratus. Summer (Feb–March) and winter (July–September) data were collected within the same calendar year (2010, 2012, 2013, 2015, and 2016), with the exception of 2007 that were collected in February 2007 and therefore were modeled with winter data collected from the previous year in August-September 2006 (Lindfield, 2007). A Poisson GLMM was fitted with season (summer and winter), zoning (no take and partially protected), and location (Broughton Island and Fingal Island) as fixed factors. Year was considered a random factor as there are six near continual years of data. Individual BRUV deployments were treated as an observation-level random effect to account for overdispersion (Harrison, 2014). Although the zoning plan for the PSGLMP was officially implemented in April 2007, there was a 12-month educational/transition period where there was focus on education of fishers, rather than issuing of infringement notices, whilst considerable fishing pressure still occurred within the no-take areas during this period (DPI compliance data unpub). So whilst the 2008 sampling occurred 10 months after the zoning plan was implemented, it is considered prior to marine park zoning enforcement. To assess how the relative abundance of C. auratus would increase within no-take areas following the implementation of the PSGLMP zoning plan, relative abundance data from summer (Feb–March) data were compared across seven survey periods (2007, 2008, 2010, 2012, 2013, 2015, and 2016) at the two locations (Broughton and Fingal). These two locations were chosen as they are the only sites in the PSGLMP that had data prior to the enforcement of the marine park zoning plan. A GLMM model was fitted with zoning (no take and partially protected), establishment of marine park (before and after) and location (Broughton Island and Fingal Island) treated as fixed factors and year as random factor with a Poisson distribution. To account for overdispersion individual BRUV deployments were treated as an observation-level random effect (Harrison, 2014). To evaluate changes in the relative abundance of C. auratus across the entire marine park following enforcement of zoning, data were analyzed across 13 locations (5 no-take, 5 partially protected, 3 outside marine park) and across 6 winter (July–August) time periods (2010, 2011, 2013, 2015, 2016, and 2017). A Poisson GLMM was fitted with zoning (no take, partially protected and outside) treated as a fixed factor and location (13 locations throughout the PSGLMP) and year treated as random factors. Individual BRUV deployments were also treated as a random factor to account for overdispersion (Harrison, 2014). LMMs were fitted using a Gaussian distribution to test for the effects of zoning on the mean total length and the Lmax (maximum total length of a fish per BRUV drop) of C. auratus across the PSGLMP. Zoning (no take, partially protected, and outside) was treated as a fixed factors while year and location were treated as random factors. The mean relative abundance for C. auratus across all zones, locations and years combined was 4.9 ± 1.1 (SE) for summer compared to 5.2 ± 1.3 (SE) for winter (Figure 2). The GLMM estimated relative abundances of C. auratus to be significantly higher in winter when compared with summer (β = 0.01, p = 0.04), however, the estimated effect size was very small at 1.3 (1.01–1.65 95% CI) times the number of C. auratus in winter than summer when keeping all other factors constant. This result is likely driven by the high numbers of C. auratus recorded in winter during 2010 at Fingal Island (Figure 2). There was also a significant difference in the relative abundance of C. auratus across zoning (β = 0.57, p < 0.01) with a predicted 1.78 (1.40–2.25 95% CI) times more C. auratus within no-take areas when compared with PPAs. The model suggests that there is no significant difference in relative abundance of C. auratus between the two locations (β = −0.01, p = 0.23) with 0.90 (0.76–95% CI) times the number of C. auratus estimated for Fingal Island when compared with Broughton Island. Figure 2. Seasonal variation in the mean relative abundance (MaxN ± SE) of C. auratus, 2007–2016. (A) no-take areas (B) partially protected areas (fished areas). Dark bars = Summer (Feb–March) surveys, light bars = Winter (July–August) surveys. The mean relative abundance of C. auratus in the Broughton Island no-take area prior to zoning plan enforcement in April 2008 was 3.4 ± 0.6 (2007–2008 combined) compared with a mean relative abundance 8 years later of 9.9 ± 1.6 (2015 – 2016 combined); an increase of 2.91 times (191% increase) in relative C. auratus abundance over that time period (Figure 3). Over the same period, the partially protected area at Broughton Island showed a 22% increase in relative abundance (2007/08: 3.3 ± 0.6 vs. 2015/16: 4.1 ± 0.7). Figure 3. Mean relative abundance (MaxN) with standard error of Chrysophrys auratus at Broughton Island recorded on BRUVS from 2007 to 2016 in Summer (February-March). Dark bars = no-take area, gray bars = partially protected area. Dashed line indicates when marine park zoning regulations were implemented and enforced. The GLMM had a significant two-way interaction with zone and location (β = −0.41, p = 0.04). Therefore, both locations, Broughton Island and Fingal Island, were modeled separately. The Broughton Island model had a significant zoning effect (β = 0.76, p < 0.01) with a predicted 2.20 (1.70–2.73 95% CI) times more C. auratus within no-take areas when compared with PPAs (Figure 3). For Broughton Island, there was also a significant effect of before and after establishment of the marine park (β = 0.49, p < 0.01). It was estimated that for Broughton Island there are 1.65 (1.15–2.32 95% CI) times more C. auratus after the establishment of the marine park than prior (Figure 3). The Fingal Island model also gave a significant effect of zoning (β = 0.36, p = 0.02). 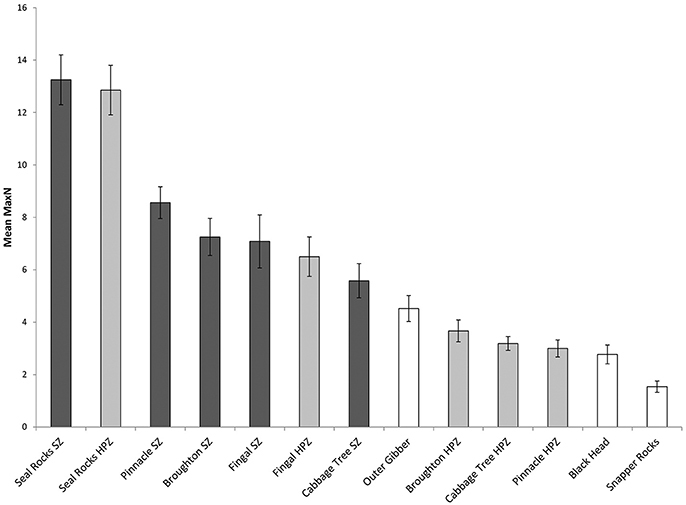 However, the effect size was much smaller than Broughton Island with 1.43 (1.05–1.96 95% CI) times more C. auratus within no-take areas when compared with PPAs (Figure 4). There was no significant effect of before and after establishment of the marine park for Fingal Island (β = 0.32, p = 0.35). Figure 4. Mean relative abundance (MaxN) with standard error of Chrysophrys auratus at Fingal Island recorded on BRUVS from 2007 to 2016 in Summer (February–March). 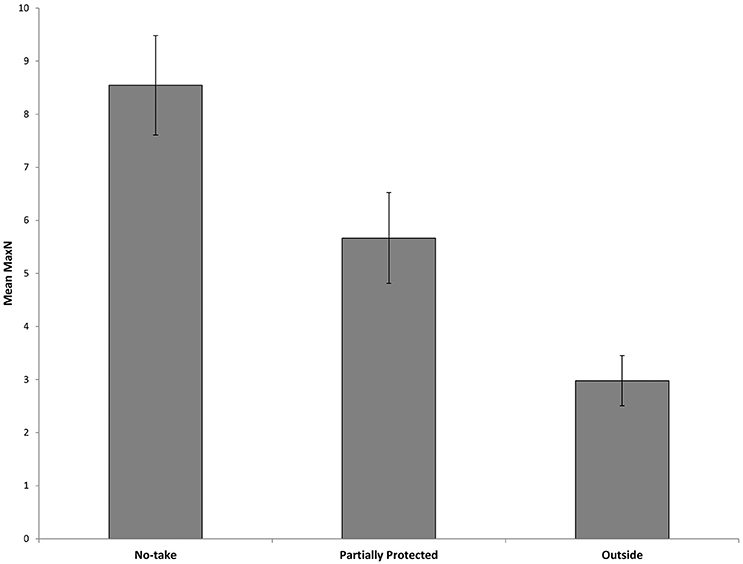 Dark bars = no-take area, gray bars = partially protected area. Dashed line indicates when marine park zoning regulations were implemented and enforced. Surveys comparing locations within and outside the marine park from 2010 to 2017 recorded a total Max N of 3829 C. auratus from 624 BRUVs deployments. A total of 2003 C. auratus were recorded in the no-take areas (n = 5), 1402 in the PPAs (n = 5) and 424 at sites outside the marine park (n = 3). On average there were more C. auratus found within no-take areas (8.5 ± 0.9 SE), whilst the PPAs (5.7 ± 0.8 SE) were found to have more C. auratus than sites outside the marine park (2.9 ± 0.5 SE) (Figure 5). The abundance of C. auratus peaked within the no-take areas in 2011, with a mean relative abundance of 10 ± 1.1, whilst the highest abundance recorded in the PPAs was 6.8 ± 0.8 in 2017 (Figure 6). The relative abundance of C. auratus was greatest at the Seal Rocks location, for both no-take and PPAs (Figure 7). The highest recorded number of C. auratus recorded for a single drop in a no-take area was 36 individuals in the Fingal Island no-take area in 2017, followed by 31 individuals recorded in Seal Rocks no-take area in 2011. Two of the sites outside the marine park (Black Head and Snapper Rocks) were found to have the lowest relative abundance of C. auratus (Figure 7). Figure 5. Mean relative abundance of C. auratus (with standard error) for each management type with all years (2010, 2011, 2013, 2015, 2016, and 2017) combined. No-take = no-take areas, Partially Protected = partially protected areas and Outside = locations outside the marine park. Figure 6. Mean relative abundance of C. auratus (with standard error) for each management type across years. Dark bars = no-take areas, Gray bars = partially protected areas and White bars = locations outside the marine park. Figure 7. Mean relative abundance of C. auratus (with standard error) by each location for all years (2010, 2011, 2013, 2015, 2016, and 2017) combined. Dark bars = no-take areas (SZ), Gray bars = partially protection areas (HPZ), White bars = outside the marine park. The model results showed a significant difference in C. auratus relative abundance between zoning across the entire marine park (p < 0.001). There were higher relative abundances of C. auratus within no-take areas when compared with locations outside the marine park (β = 0.86, p < 0.01) with 2.36 (1.34–4.17 95% CI) time more C. auratus within no-take areas. The pattern was not as apparent when comparing PPAs with locations outside the marine park (β = 0.44, p = 0.13). Model estimates suggested that on average there are 1.55 times more C. auratus within PPAs compared to locations outside of the marine park with the confidence intervals ranging from slightly fewer to almost three times more C. auratus (0.88–2.74 95% CI) within PPAs compared to outside of the marine park. A total of 2,189 length measurements were recorded across the three different management zones between 2011 and 2017. Whilst Snapper Rocks was the site that recorded the fewest C. auratus (Figure 7), this location produced the largest mean sized C. auratus across all years combined (mean: 31.8 ± 10.8 cm) (Figure 8). The largest mean size across all years for a no-take areas was the Pinnacle (mean: 31.5 ± 6.3 cm) and for a partially protected area was also the Pinnacle location (mean: 26.0 ± 6.6 cm). The smallest mean size C. auratus were found in the Cabbage Tree Island, a partially protected area (mean: 23.4 ± 5.7 cm) that is located close to the mouth of the Port Stephens estuary. The percentage of C. auratus above the legal size limit in NSW (30 cm) was 31% in the no-take areas, compared to only 11% in the PPAs and 20% at sites outside the marine park. Figure 8. Mean total length of C. auratus (with standard error) by each location for all years (2011, 2013, 2015, 2016 and 2017) combined. Dark bars = no-take areas (SZ), Gray bars = partially protection areas (HPZ), White bars = outside the marine park. The effect of zoning was significant (p < 0.001) in the model for C. auratus lengths. On average C. auratus within no-take zones were 1.38 cm (−2.18–4.16 cm 95% CI) longer than C. auratus at locations outside the marine park. In comparison, C. auratus within PPAs were on average 3.22 cm (−6.80–0.13 mm 95% CI) smaller when compared to fish at locations outside the marine park. The mean maximum length (Lmax = maximum recorded C. auratus total length per BRUV drop) for C. auratus in no-take zones was 39.2 ± 10.2 cm, compared with 29.1 ± 5.3 cm in the PPAs and 30.1 ± 6.9 cm for sites outside the marine park. The largest sized C. auratus (Lmax) were recorded in the Seal Rocks no-take area with a mean size across all years of 44.3 ± 2.4 cm, closely followed by the Pinnacle no-take area with 43.6 ± 1.9 cm. Within the no-take areas, 4.6% of recorded C. auratus were > 50 cm, compared to only 0.3% in both the PPAs and sites outside the marine park. The largest fish was recorded in the Seal Rocks no-take area in 2013 and measured 102 cm. The location which had the smallest Lmax was the Cabbage Tree Island partially protected area with a mean size of 26.6 ± 1.1 cm. There was a significant effect (p < 0.001) of zoning on the Lmax for C. auratus. On average, the Lmax for C. auratus inside no-take zones was 8.04 cm (3.34–12.65 cm 95 % CI) longer than locations outside the marine park. The Lmax for C. auratus in PPAs was more variable and on average 1.42 cm (−6.11–3.24 cm 95 % CI) smaller when compared with the Lmax on BRUV drops outside the marine park. This study demonstrates a clear positive response of MPAs providing protection to an important fishery targeted species. The removal of fishing pressure led to an almost 3-fold increase in the abundance of C. auratus over an 8-year period within the no-take area at Broughton Island. This increased abundance and size within no-take areas compared to fished sites is consistent with studies of this species elsewhere (Willis et al., 2003; e.g., Malcolm et al., 2015); however, this study also includes a baseline before reserve establishment where noticeable differences occurred only after the MPA was enforced. Similar to Malcolm et al. (2015), the biggest changes occurred in the first 3 years of marine park enforcement, and consistently higher abundances were found within the no-take areas and little change detected in the fished areas. This study reinforces previous findings that no-take areas result in increased abundances of C. auratus, but also suggests that PPAs in close proximity to the no-take areas also benefited from marine park implementation. A key argument that both commercial and recreational fishers pursued during the establishment of the PSGLMP was that the declaration of no-take areas within the marine park would cause considerable shift in fishing effort leading to increased pressure on areas outside the no-take areas, and that marine park implementation would negatively affect their ability to catch fish (Martin et al., 2016). The fishers view was that fish stocks, particularly targeted species such as C. auratus, would decline in the areas open to fishing, such as the PPAs, as a result of displaced fishing effort because of the implementation of the no-take areas. Whilst a shift in fishing effort in locations around the PSGLMP has occurred as a result of displacement from no-take areas, the results from this study indicate that the abundance of C. auratus within the fished PPAs has not significantly declined as a result of increased fishing activity. There were significantly more C. auratus found within the no-take areas; however, the PPAs still maintained significantly higher abundance than those locations outside the marine park. Particularly, the rocky reef system of the Seal Rocks partially protected area was the locality that contained on average the second highest abundance of C. auratus across all locations sampled. It has been shown that MPAs can increase a fishery yield, even when fishers are displaced through implementation of no-take areas (Kerwath et al., 2013). Whilst the relative abundance of C. auratus in both 2015 and 2016 across all locations were higher in the no-take area than the fished PPAs, the difference in abundance was small and not significant. In fact, the relative mean abundance within the PPAs (5.7 ± 0.8) is actually very similar to the reported abundance of C. auratus on deep rocky reef no-take areas, and much higher than no-take shallower reefs for the Solitary Islands Marine Park located several hundred kms to the north (Malcolm et al., 2015). This study suggests that fishers' yield of C. auratus within the PPAs should be the same, or higher, following the implementation of the MPA in 2007. In a survey of recreational fishers from the PSGLMP in 2013, it was indicated by 23% of respondents that fishing (i.e., number of fish caught) had improved since the implementation of the PSGLMP, whilst 32% considered it similar to pre zoning, 17% indicated it had declined and 28% could not say (Martin et al., 2016). Whilst this survey did not specifically focus on C. auratus, it is another good indication that displaced fishing effort has not contributed to the theory that fishery landings would decrease following marine park implementation within the fished areas of the marine park. 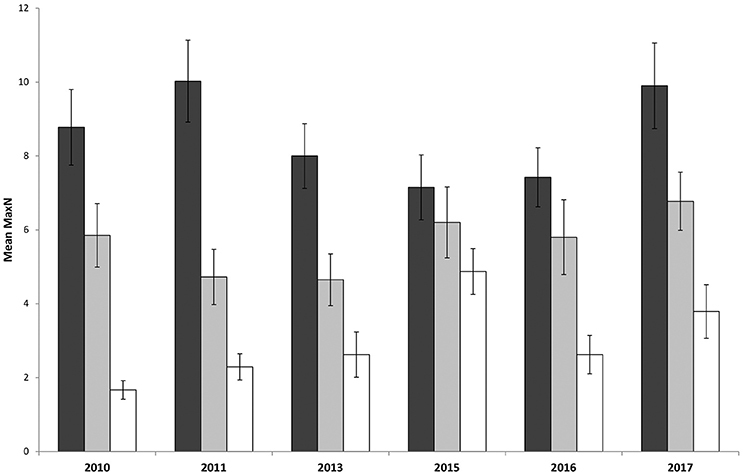 Populations of C. auratus over summer within the Broughton Island no-take area were significantly higher each sampling year following zoning plan implementation, when compared to the nearby Broughton Island partially protected area. The changes at Fingal Island were more variable; but there was a pronounced switch from before the no-take area was enforced, from a higher abundance in the soon to be fished area to where the general trend now remains for higher abundance in the no-take area. 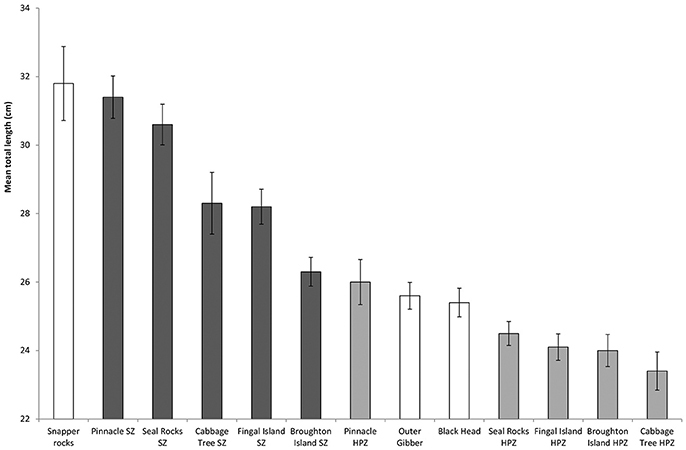 The difference in zoning response in comparison to Broughton Island may be attributed to the fact that the Fingal Island no-take area covers a smaller area (297 vs. 828 ha), as it is well documented that the size of protected areas affects the effectiveness in increasing fish biomass (Gaines et al., 2010; Malcolm et al., 2016). It has also recently been shown that both Labrids (wrasses) and Sparids were found to significantly increase in abundance within the Broughton Island no-take area compared with only small increases in the Fingal Island no-take area (Harasti et al., 2017). Chrysophrys auratus are known to utilize urchin barren habitats (Babcock et al., 1999; Parsons et al., 2014) and given that the Broughton Island no-take area is dominated by Centrostephanus rodgersii urchin barrens, whilst Fingal Island is dominated by kelp Ecklonia radiata (Masens, 2009), it is likely that differing relative abundances between the two locations are influenced by both size and habitats within the no-take areas. This study demonstrates that the no-take areas in the PSGLMP are maintaining larger fish, with the mean length of C. auratus, and the largest observed fish per BRUV deployment, in the no-take areas being significantly larger than those sites open to fishing. These size increases within the no-take areas compared to fished areas support previous findings (Babcock et al., 1999; Malcolm et al., 2015), and also introduces a new metric Lmax that can be used in future BRUV studies to assess the largest fish per deployment, rather than just relying on mean length estimates taken at MaxN. One-third of the C. auratus found within the no-take areas were found to be over the 30 cm legal size limit for C. auratus in NSW, whilst the proportion of fish found over the legal size limit in the PPAs and locations outside the marine park being much lower (11% and 20%, respectively). Chrysophrys auratus is one of the most important recreational and commercial fishery species in NSW, but commercial catch landings are in decline and the species is considered “growth overfished” in NSW. Given that the no-take areas are providing refuge for larger C. auratus, a species susceptible to reduced population resilience through age-class truncation (Stewart, 2011), these no-take areas could potentially contribute to rebuilding of local populations as the larger fish are more likely to have higher fecundity and quality of eggs (Berkeley et al., 2004; Stewart et al., 2009). In a recent study in New Zealand, it was demonstrated through genetic parentage and relatedness analysis that adult C. auratus within a no-take reserve contributed newly settled juveniles to surrounding areas (Le Port et al., 2017). Whilst the increased abundance and size of C. auratus within the no-take areas could be contributing to other areas of the marine park by way of larval dispersal and newly settled juveniles, the fishery benefit of this is yet to be quantified and warrants further investigation. Seasonal variation in the abundance of C. auratus has previously been reported from New Zealand (Kingett and Choat, 1981; Francis, 1995; Willis et al., 2003; Denny et al., 2004); however, there is limited evidence of seasonal movements in Australia. Seasonal surveys in this study indicated that there were significant differences in C. auratus abundance within the fished and no-take areas of the marine park over six yearly survey periods, although there were only a few occasions where seasonal differences were detected (Broughton Island no-take 2016 and partially protected area 2013, Fingal Island partially protected area 2010). Whilst seasonal variation was observed on a few occasions, there were several years with no differences in abundance of C. auratus suggesting that the species displays some site fidelity to these rocky reefs. It has been previously demonstrated that C. auratus within the PSGLMP predominantly have small home-ranges and display strong fidelity (Harasti et al., 2015a). This site attachment behavior suggests that C. auratus could make a good indicator species when assessing the effectiveness of MPAs, particularly for the no-take areas, which this study has shown to increase abundance and size of C. auratus. If the relative abundance or size of C. auratus were found to decrease, particularly within the no-take areas, there could be environmental variables influencing their behavior, or alternatively be a result of illegal fishing activities occurring within the marine park. The no-take areas within the PSGLMP are proving to be effective in increasing both the size and relative abundance of C. auratus, and that the relative abundance of C. auratus has increased within the PPAs, even with the increased fishing effort through displacement from establishment of no-take areas. At the local level, the current zoning arrangements of the PSGLMP is contributing towards achieving one of the objectives of the MPA system, and overall, the network of marine parks along the NSW coast are likely to benefit populations of C. auratus through no-take and PPAs. This project was conducted in accordance with NSW Department of Primary Industries Animal Care and Ethics Committee permit number: 10/09. DH, SL, and AJ: Original idea; DH, AJ, EM, and SL: Study design; DH, JW, EM, and SL: Performing the experiments; JW and DH: Data analyses; DH, JW, EM, SL, and AJ: Writing a draft of the article and final approval of the version to be published. This research was funded by the NSW Department of Primary Industries. Some of this work was supported through student research projects at Newcastle University and Southern Cross University. To all the staff and casuals that helped with fieldwork and video analysis over the past 10 years, including Christopher Gallen, Roger Laird, Kate Lee, Tom Davis, Britt Anderson, Max Haste, and Art Schultz. We are grateful to Dr. Hamish Malcolm and Luke Erskine for initial comments on the manuscript and to Damian Collins for assistance with statistical analysis. Some of this work was conducted as part of B.Sc. (Hons.) research projects at Newcastle University (SL) and Southern Cross University (EM). Harvey, E. S., and Shortis, M. R. (1998). Calibration stability of an underwater stereo-video system: implications for measurement accuracy and precision. Mar. Technol. Soc. J. 32, 3–17. Lindfield, S. (2007). Spatial, Temporal and Depth Related Variation in Reef Fish Assemblages of the Port Stephens-Great Lakes Marine Park, Detected with Baited Remote Underwater Video Stations. Honours thesis, University of Newcastle. Masens, O. (2009). Methods of Monitoring Distribution and Heterogeneity of Subtidal Reef Habitats Within the Port Stephens-Great Lakes Marine Park using Underwater Video Surveillance with Emphasis on Urchin Barrens. Honours thesis Honours, University of Newcastle. Stewart, J., Rowling, K., Hegarty, A.-M., and Nuttall, A. (2009). “Size and age at sexual maturity of snapper Pagrus auratus in New South Wales 2008/09,” in Fisheries Research Report Series: 27 (Cronulla: NSW Department or Primary Industries). Copyright © 2018 Harasti, Williams, Mitchell, Lindfield and Jordan. This is an open-access article distributed under the terms of the Creative Commons Attribution License (CC BY). The use, distribution or reproduction in other forums is permitted, provided the original author(s) and the copyright owner are credited and that the original publication in this journal is cited, in accordance with accepted academic practice. No use, distribution or reproduction is permitted which does not comply with these terms.